In a nutshell: A dramatic cliff-framed beach and bay. Minuses: Beach can vanish and surf can become dangerous in winter. 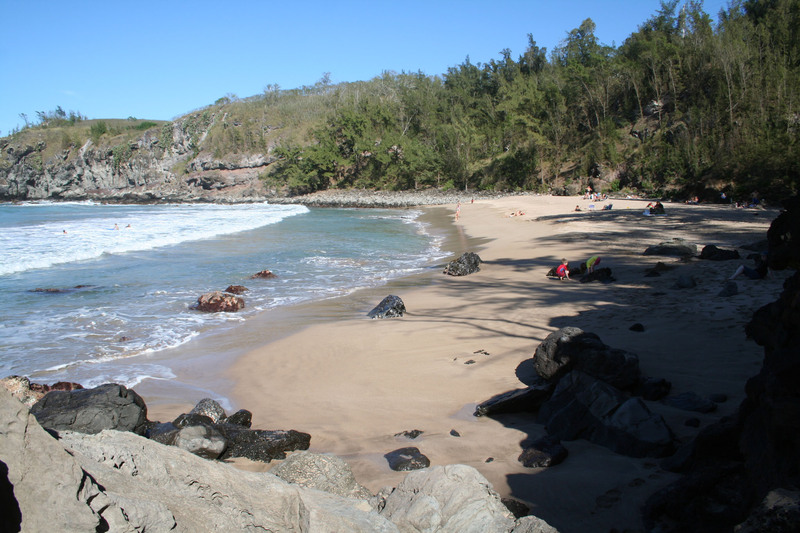 The name “Slaughterhouse Beach” comes from the Honolua Ranch slaughterhouse and tanning/storage shed that were (oh, so conveniently) located on the cliff’s edge above the ocean. The buildings were torn down in the 60’s, but the lovely name stuck. In contrast, the Hawaiian name Mokule’ia means “district of abundance”, and like most Hawaiian names, is a very accurate description. Mokule’ia Bay is part of the same preserve as its neighbor Honolua Bay: the Honolua-Mokule’ia Bay Marine Life Conservation District. But unlike its rocky neighbor to the north, much of the year this bay has a nice sandy beach to relax on. 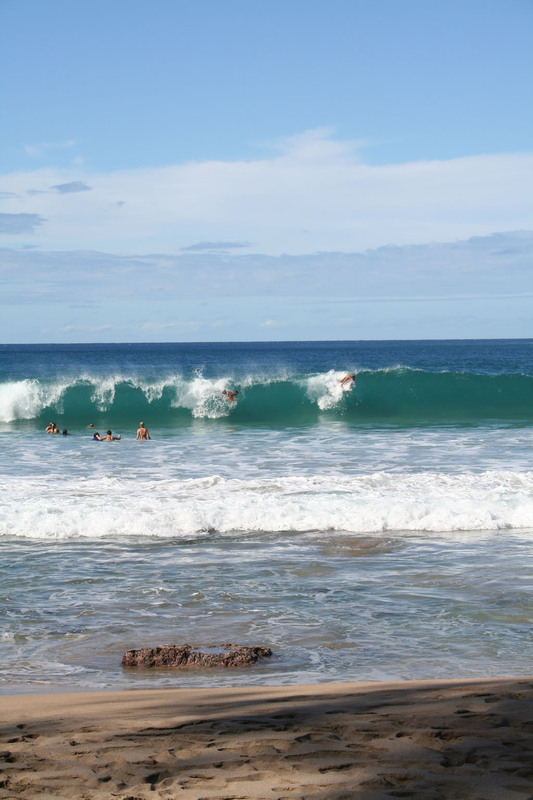 During the winter months there are often large well-formed waves that are perfect for the more experienced boogie boarders and surfers. But the large surf can often become dangerous, and even the most experienced need to keep a healthy respect for the ocean in mind. In summer months the waves are much more mellow and are often suitable for beginners. When the ocean is tame there is also very good snorkeling around the the north point and into Honolua Bay. The cliff faces and trees give shade early and late in the day. Parking is on-street and minimal. There are concrete stairs with a railing that will take you from the ~100′ elevation parking down most of the way to the beach. This area suffers from break-ins so take your valuables with you and leave your car unlocked so you don’t lose a window. Very Beautiful Beach! Clean clear water with Fun Big Waves! Nice sand too! Not very crowded and where the locals go. Snorkeling is pretty good here also. Swam with a few turtles! 🙂 Parking can be crazy but it works. Nice walkway down to the beach and some shade is provided in the afternoon. Great beach to body surf and boogie board!! Love this beach, a lot less crowded and great waves for playing in! Great snorkeling too, saw turtles here! Shade available but minimal parking, people are usually coming and going though so it’s ok! Lovely spot!